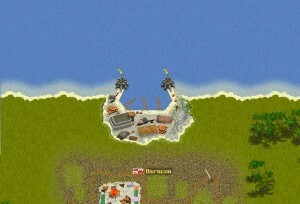 There are five different types of cities in world of pirates. 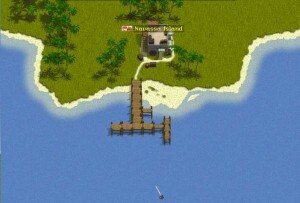 Dock is the smallest type of city, you cannot attack a dock. Besides that docks are like every other city, except that in the pub is maximum five different specialists you can hire. City is the smallest city you can attack, it has maximum 2000 soldiers in it and the governor condition will 390, 410 or 440. City with wall is as strong as a city without wall, so it also has maximum 2000 soldiers in it and the governor condition will be 390, 410, 420 or 440. City with one fort will shoot you. if you fire upon it or if it is of a hostile nation. Learn all about nations here. 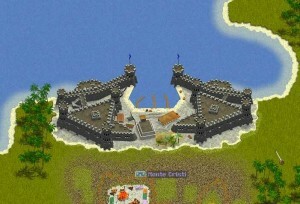 City with one fort has maximum 3500 soldiers in it and the governor condition will be 530 or 560. 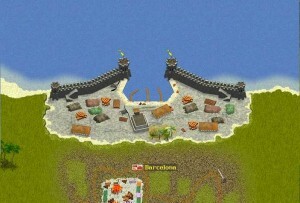 City with two forts will shoot you. if you fire upon it or if it is of a hostile nation. 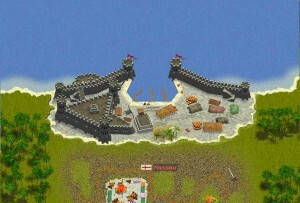 City with two forts has maximum 5000 soldiers in it and the governor condition will be 650 or 680. To find a list with the exact governor condition, click here.